When setting up Kerberos, install the KDC first. If it is necessary to set up slave servers, install the master first. that time synchronization and DNS are functioning correctly on all client and server machines Ensure before configuring Kerberos. Pay particular attention to time synchronization between the Kerberos server and its clients. If the time difference between the server and client is greater than five minutes (this is configurable in Kerberos 5), Kerberos clients can not authenticate to the server. This time synchronization is necessary to prevent an attacker from using an old Kerberos ticket to masquerade as a valid user. 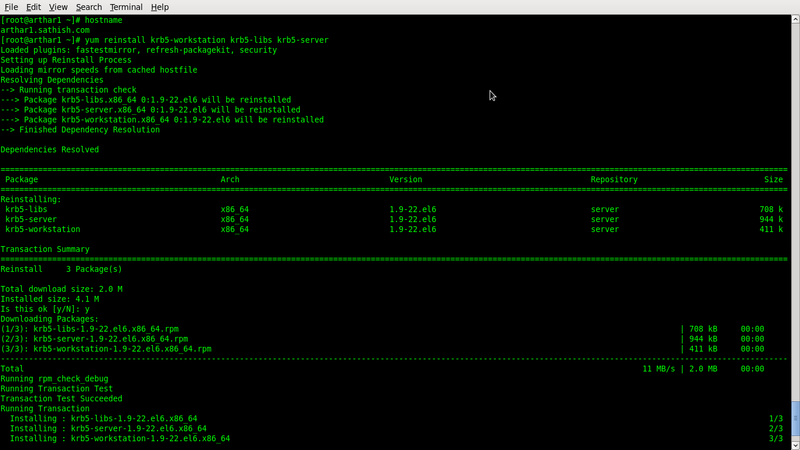 Install the krb5-libs, krb5-server, and krb5-workstation packages on the dedicated machine which runs the KDC. This machine needs to be very secure — if possible, it should not run any services other than the KDC. Edit the /etc/krb5.conf and /var/kerberos/krb5kdc/kdc.conf configuration files to reflect the realm name and domain-to-realm mappings. A simple realm can be constructed by replacing instances of EXAMPLE.COM and example.com with the correct domain name — being certain to keep uppercase and lowercase names in the correct format — and by changing the KDC fromkerberos.example.com to the name of the Kerberos server. By convention, all realm names are uppercase and all DNS hostnames and domain names are lowercase. After kadmind and krb5kdc has been started on the server, any user can access its services by running kadmin on any of the clients or servers in the realm. However, only users listed in the kadm5.acl file can modify the database in any way, except for changing their own passwords. 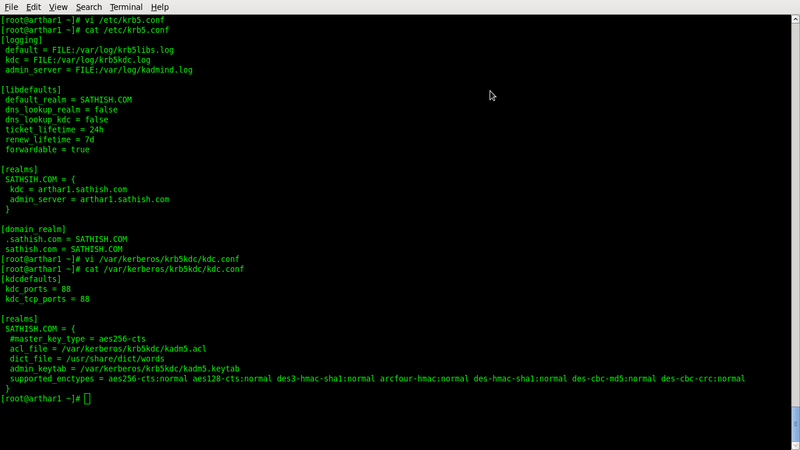 The kadmin utility communicates with the kadmind server over the network, and uses Kerberos to handle authentication. Consequently, the first principal must already exist before connecting to the server over the network to administer it. Create the first principal with the kadmin.local command, which is specifically designed to be used on the same host as the KDC and does not use Kerberos for authentication. Verify that the KDC is issuing tickets. First, run kinit to obtain a ticket and store it in a credential cache file. Next, use klist to view the list of credentials in the cache and use kdestroy to destroy the cache and the credentials it contains. Hi there you have a nice blog over here! Thanks for posting this interesting stuff for us! If you keep up the good work I’ll visit your blog again. Thanks! I read this post fully concerning the comparison of most recent and earlier technologies, it’s awesome article. like to shoot you an e-mail. I’ve got some ideas for your blog you might be interested in hearing. Either way, great site and I look forward to seeing it grow over time. Hi there! This blog post couldn’t be written much better! Going through this post reminds me of my previous roommate! He always kept talking about this. I most certainly will forward this post to him. Pretty sure he will have a great read. Many thanks for sharing! I’m not certain the place you’re getting your info, but good topic. I must spend some time studying more or understanding more. Thanks for excellent information I was in search of this info for my mission.